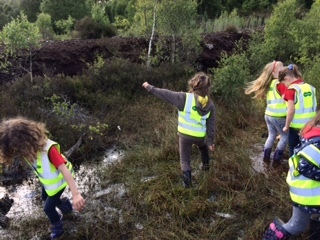 Transition Wilmslow’s Dawn Walk this year, on 22nd September will have certain poignancy as the group remembers Rick Turner, the archaeologist who recovered Lindow Man – the best preserved bog body in Britain. Rick died earlier this year and the walk will be an appropriate time to reflect on his work. 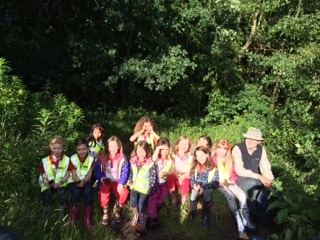 He gave the keynote presentation at a Transition Wilmslow Day School about Lindow Moss in 2015 and had been supportive of the group’s Lindow Moss planning applications. 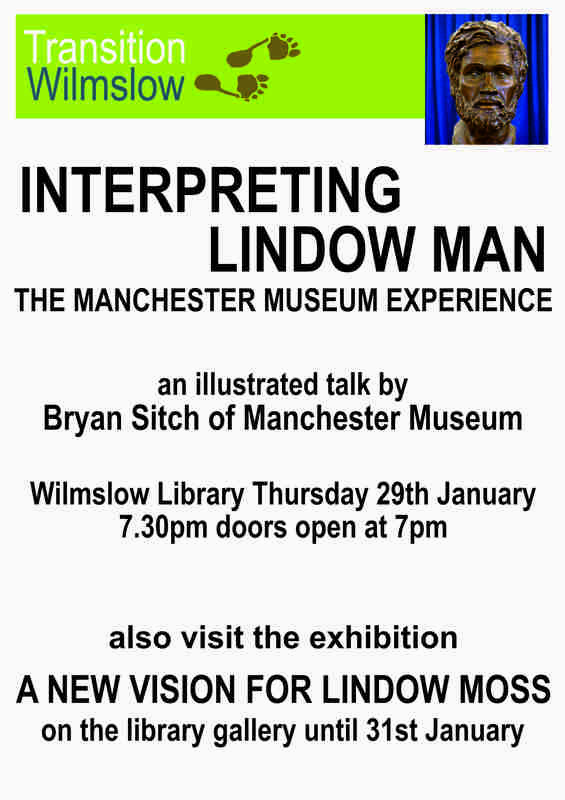 Rick took part in the Dawn Walk organised by Transition Wilmslow in 2016 and gave a memorable account of what he imagined might have been Lindow Man’s last journal entries before his death. He also underlined the importance of the cultural landscape of the Moss extending back thousands of years. It is still in a condition where it can be recreated as a lowland raised mire. All who rose early on Saturday morning to experience dawn breaking on the Moss were not disappointed! We started out at 4.30am in darkness and made our way around Black Lake, across Lindow Common, Newgate Lane and onto the Moss in time to experience an atmospheric sunrise with mists hanging low over the peat bog. Along the way we stopped to hear readings about the landscape now and in the past. One of the guests on the walk was Rick Turner, a leading figure with the British Museum on the exhumation, examination and preservation of the body of Lindow Man. Rick gave a reading that he had been inspired to compose – a diary entry as if it had been written in 1st Century AD by this bog man in his last hours leading up to being sacrificed at first light. This focused our thoughts as a bouquet of flowers from the bog was laid on the water in commemoration of Lindow Man. Transition Wilmslow has another Moss walk planned for 17 September 2016 – at the more reasonable hour of 10am! See our Diary Page for this and other events. The Wilmslow Guild Natural History Society are hosting a talk on on “The Delamere Lost Mosses Project” by Katie Piercy (the Cheshire Wildlife Trust Delamere Mossland Officer). The talk will be about the current ongoing restoration of mossland habitats within the Delamere Forest and surrounding area. 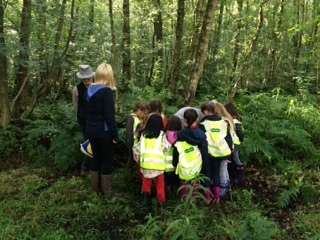 It will go through the history of the meres and mosses and what makes them so important, and then go into detail about what conservation methods that are being used in Delamere Forest. 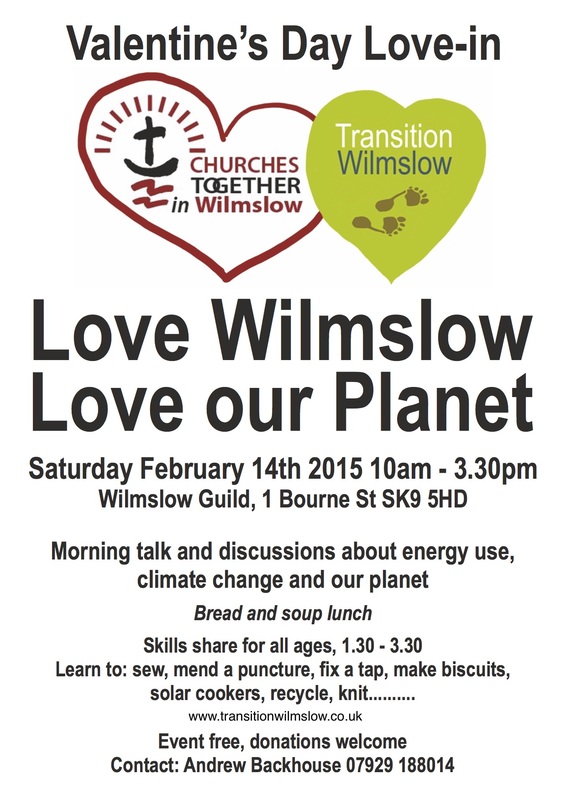 This was the main theme at ‘Love Wilmslow, Love Our Planet’, a joint venture with Churches Together in Wilmslow and Transition Wilmslow at The Wilmslow Guild on St Valentine’s Day 2015. What do we have in common? It’s a wish to look after our planet, to keep it for future generations too, and to take steps to reduce climate change. We could rapidly reduce UK greenhouse gas (GHG) emissions to net zero by 2030, using only currently available technology. We could reduce our energy demand by around 60%, with particularly large savings in heating buildings and transport. It is possible to meet 100% of the UK’s energy demand with renewable and carbon neutral energy sources; without fossil fuels and without new nuclear. Read more here and download the latest report. After a bread and soup lunch Professor John Handley gave a talk entitled ‘Lindow Moss; Making Sense of the Planning Application, followed by discussion. Meanwhile there were craft and recycling activities to learn – composting, biscuit decoration, crochet, knitting, making gift boxes from Christmas cards to name a few. A highlight was a ‘stomp’ – a musical and movement performance using scrap material, organized by Wilmslow High School students. Participants were also alerted to many local initiatives to reduce climate change. Some are recycling tools through Work Aid, raising money for solar lights and cookers for slums in Nairobi through Kibera in Need and cutting down on food waste through Waste Watch. If we don’t do a lot to cut our energy consumption, the future for our children will be very different with climate change. So how do we get there? Part of the way forward must be to strengthen our community. We need to encourage one another, and the town council could be a leader in this. Perhaps we could have electric cars and bikes as a greener part of the Wilmslow Motor Show! Most of all it should be fun! See what Low Carbon Lymm is doing. Also…..
Ashton Hayes, a community of about 1,000 people, is aiming to become England’s first carbon neutral community. By working together, sharing ideas and through behavioural change they have reduced carbon emissions by 23% since 2006. RGS-IBG members free, non-members £5 donation on the door. It’s 30 years since he was discovered!